In the past few days, I’ve heard about a “Best iPad Salesman Ever” video making the rounds. “Hm,” I thought. “That sounds familiar. Maybe I should take a look.” What a surprise — it’s me in the video. What’s up? Because YouTube is banned in his country, a Facebook user from Islamabad had copied the video from YouTube and posted it on his Facebook channel. Within a week the video had been shared on Facebook more than 60,000 times. If the video had been tagged with my name, it might have done even better. Isn’t it always amazing how fast content spreads over the Internet these days? Hey, I’m not complaining. At least now I can explain the unusual increase of requests for performances and appearances in the Arab world I’ve received this past week. 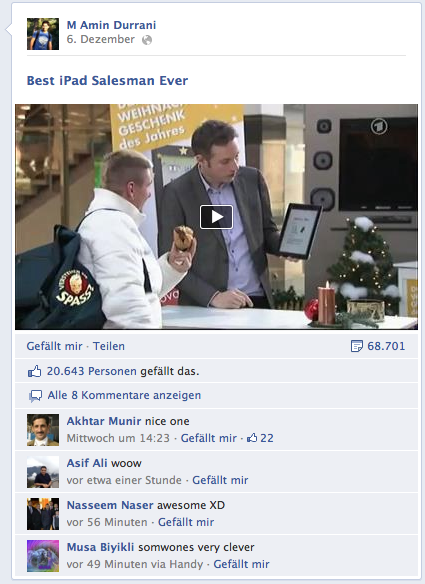 “Best iPad salesman” indeed! Besides, just in time for Christmas, see and enjoy the magic iPad clips on my APPvent Calendar.